Baublicious: It's Done! 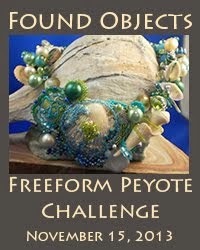 Just in time for the UnFinished Object Blog Hop! It's Done! 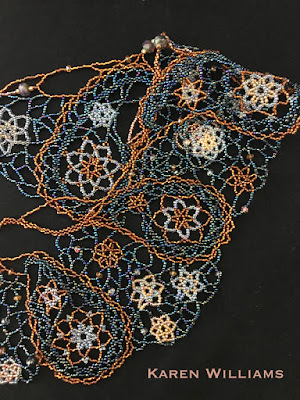 Just in time for the UnFinished Object Blog Hop! I trimmed the last beading thread Sunday afternoon and there was much rejoicing! Thanks to two back-to-back UnFinished Objects Challenges, one of my oldest UFOs is finally complete. 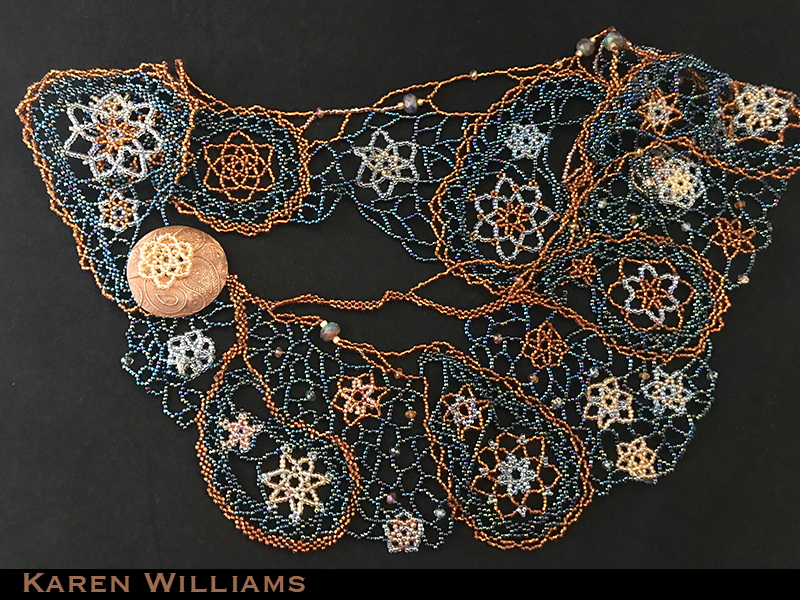 I started work on this collar back in 2012 - and picked it up now and then through the years. The collar just kept growing, without ever nearing completion. It reminded me of an explanation one of my early teachers used about approaching infinity numerically - that you could get closer and closer to infinity, but by it's very nature, you could never actually reach infinity by counting. Thank goodness that wasn't truly the case here, as the picture shows! 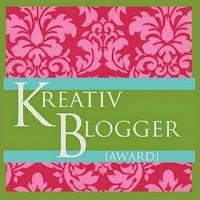 And thank you to everyone who helped make this possible by agreeing to participate in another blog hop. 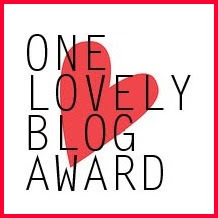 This blog hop up was just the push I needed. Without you, it likely remained an UFO another five years! I'm hoping those of you who joined int found the challenge useful, too. And here are a few additional photos of my Starry Night Collar. 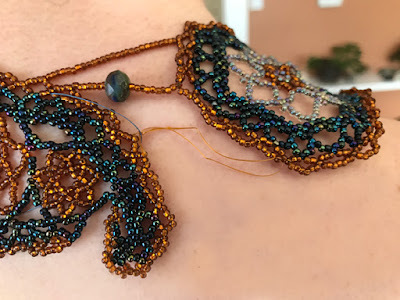 The shawl-like shape was different from any other necklace or collar I've made, and presented some unique challenges in getting everything to lay properly when worn. The final connection I needed to make was at the back, just behind my right shoulder. I couldn't get the shape right working flat, and I didn't have any handy person waiting around to be my model. (I could have likely talked my husband into doing it, but he's simply not the right size!) I ended up doing a little beading, then adding a thread guide, and put it on and had him snap a picture, so I could at least see how the connection should look. It let me see the shape I was working with. 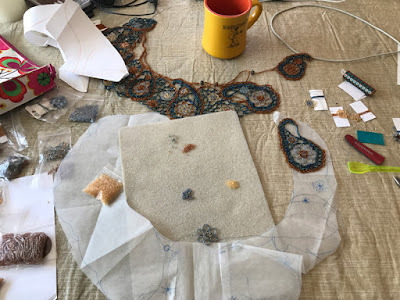 Shortly thereafter, I did manage to find a friend willing to stop by and let me do a final fitting on them before doing the last few lines of stitching. Because it's designed to drape over the shoulders, it doesn't lay completely flat when the clasp is fastened. You can see it buckling over on the right hand side if the photo. It's really hard when you're both the model and the photographer! One more photo with a black background. And there you have it! Truth is, I don't quite believe it's really done! Oh Karen, It's so very cool! I was totally wondering what it looked like on a human. Ha! So glad you shared the peek of that. I hate that it took you so long to get done, but I'm sure the relief of finally having it finished is fabulous. Bask in it! Thank you so much for hosting this hop and giving us all a good kick in the pants to get something done. I appreciate that greatly! It was just the boost I needed. So pleased to have it done! Wow, so much beauty so early in the morning - this is jaw droppingly gorgeous and delicate! As always, you explain your problem solving process so well, which I appreciate. 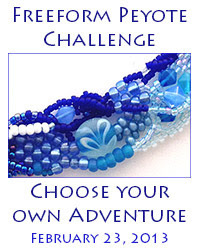 If beading were an Olympic sport, then beading behind your back would have gotten you 10s for level of difficulty, like a high dive with a triple twist and a somersault! 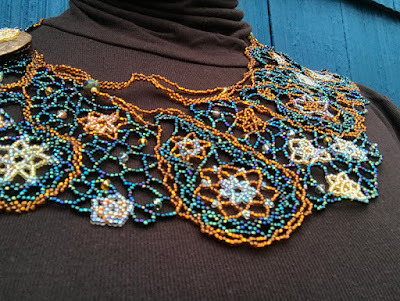 I know you're pleased to have this finished, and I hope your husband will take you to dinner somewhere fabulous so that you can wear it and show it off. Hah! I actually didn't try to stitch while it was on my body. 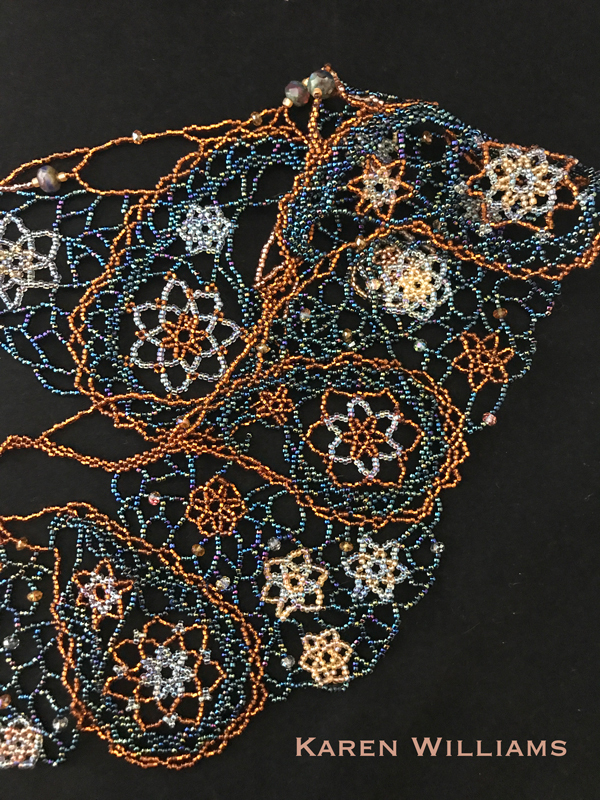 I added thread chains while it was flat, put it on and craned my neck looking over my shoulder in a mirror, and kept repeating until I figured out the best shape to finish things. You did a beautiful job! I'm a new follower. 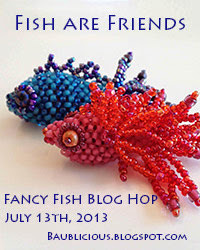 I've been beading for over 25 years and I really need to get in on these blog hops! I have plenty of UFOs myself! Welcome JoJo! I'm going to take a break from hosting any UFO hops for the next couple of months, but if you'd like I would be happy to add you to the Facebook group. what a gorgeous collar!! I love it!! Thank you again for hosting this great hop, it's really getting things moving along int he bead area! Thank you for participating! As I've said before, I really needed the push myself. It feels good to have one major UFO off the table! 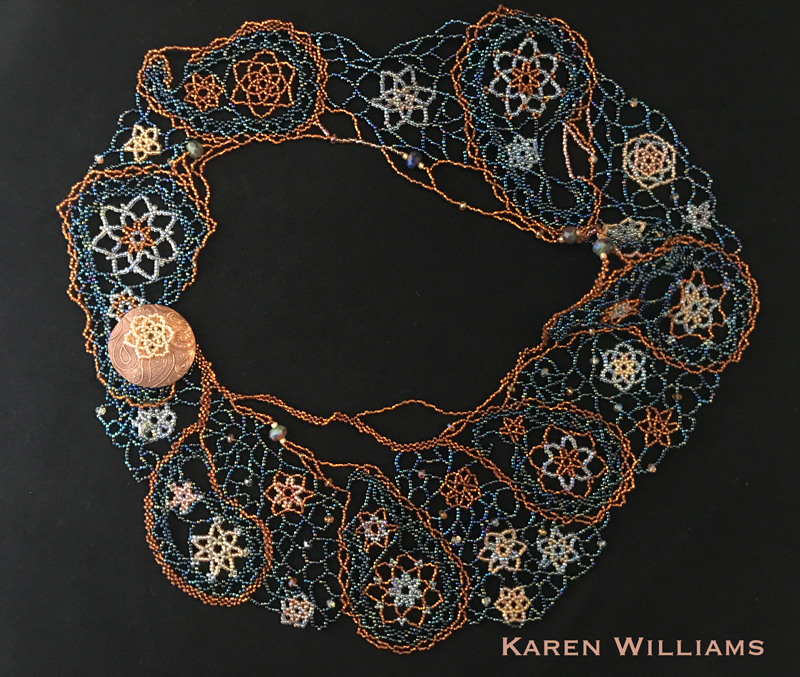 what a beautiful, and delicate piece Karen! I could see myself tangled in my thread and throwing it against the wall - no doubt you have much patience!! Thank you for hosting, and helping us all get one more UFO on the bead table! There were a few times I was about there! It helped that I created a lot of the pieces as smaller components, then added them to the whole. Your Starry Night collar is beautiful. It may have taken several years to finished, but the end result was worth the time. Thank you for the coaxing to get another UFO done, even though I didn't get mine quite done. 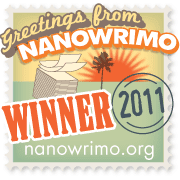 I'm looking forward to the next blog hop. Starry Night was worth every thing you went through. Delicate and ethereal. Supremely lovely. Your netting is amazing. You need to display it someplace visible so you can feel pride that you saw this big project to completion. Congratulations!!! This is one of my favorite pieces of yours ~ the lacy ways, the swirling around, the colors ~ it's artistic, edgy, and feminine. That it took 5 years to complete makes it even more beautiful. Some things just need time. Thank you for pushing yourself and the rest of us to revisit long-tucked away (and some forgotten) projects that need closure.